What is the Difference Between Trout and Salmon, How are they Related, and How do you Tell them Apart? Trout and Salmon are so closely related that some fishermen and scientists have trouble classifying the individual species. 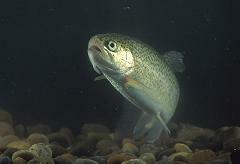 Techincally, Trout is a species of freshwater and saltwater fish. Salmon belong to some of the same family as trout but, unlike most trout, most salmon species spend almost all their lives in salt water. Both Trout and Salmon are classified as an oily fish. The steelhead and rainbow “trout” are actually the same fish. The name steelhead is used if the fish is able to make it to the ocean, and rainbow refers to those that are landlocked away from saltwater. In 1989, when DNA tests showed that the rainbow or steelhead isn’t really a trout after all, the fish was reclassified as a salmon. Likewise, the Atlantic salmon was determined not to be a salmon after all, but a trout. As another example, the sockeye salmon is called the kokanee or silver trout when it resides in fresh waterways. What Is the Difference Between Kidney Stones and Gallstones and How Do You Tell Them Apart? What is the Difference between a Salamander and a Newt and how can you tell them Apart? What Is the Difference Between a Frog and a Toad and How Can You Tell Them Apart?